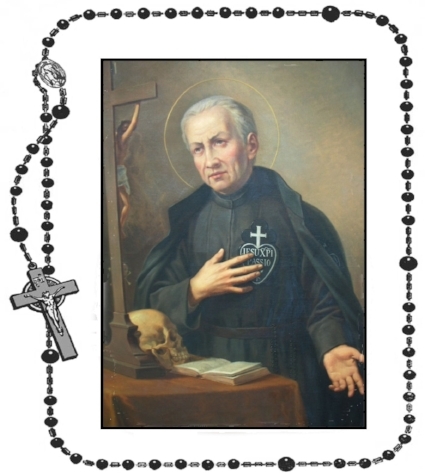 O glorious Saint Paul of the Cross, you were chosen by God to profess to all of humanity the bitter sufferings of His only-begotten Son, and to spread devotion to the Passion of Jesus throughout the world. By your preaching and holy example, Jesus converted thousands of sinners through you by bringing them to the foot of the Cross to repent of their sins, thereby obtaining for them His infinite forgiveness and mercy! May Jesus be blessed for His extraordinary grace that was so often made present in your life, and for the many miracles He worked through you for the conversion of souls! O blessed Saint Paul of the Cross, turning towards you, now I ask that from your place with Jesus and Mary in Heaven that you may look mercifully upon my poor soul and hear my prayers, and with all of your love humbly present them to Jesus for me (mention petition/s). Obtain for me also a great love of Jesus suffering, that by frequent meditation on His Passion I may take up my own cross and accept with holy resignation the sufferings that God has permitted in my life. Help me to suffer and to sacrifice in union with Jesus for the conversion of my poor soul, the souls of my loved ones, and for all of humanity. Help me to love Jesus and Mary with all of my heart, and intercede for me that I may, by the grace of God, die a holy death, and come at last to enjoy with you the blessed Presence of Jesus and Mary in Heaven for all eternity. I ask this in the name of Jesus Christ, our Lord. Amen. May the Passion of Christ be ever in our hearts! Saint Paul of the Cross, pray for us! O glorious Saint Paul of the Cross, who, by meditating on the Passion of Jesus Christ, didst attain to so high a degree of holiness on Earth and of happiness in Heaven, and, by preaching the same Passion, didst offer anew to the world the most certain cure for all its ills, obtain for us the grace to keep it ever deeply engraved in our hearts, that so we may be able to reap the same fruits both in time and in eternity. Amen.